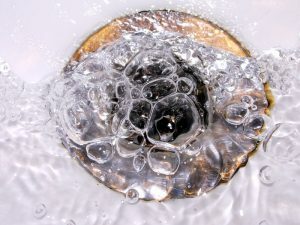 Store-bought draining cleaning “solutions” are marketed towards homeowners and renters looking to quickly clear up a drain that has slowed or stopped water flow. But any plumber is likely to warn you against using it. Keep reading to learn why! This is the first thing to be aware of—the chemicals in that store bought drain cleaning solution you bought can dissolve some, but not all, drain clogs. Most of these solutions are good at dissolving hair that may be stuck in your sink or bathtub drain, for example. But soap scum, grease in the kitchen sink, grime, food particles, and other blockages aren’t going to make the cut. The problem with the clog not dissolving is that it may only get pushed further along in your drain line. This is one way you can wind up with clogs deep along in the sewer line that requires professional tools and equipment to remove. All that leftover greasy residue gets pushed down so that additional debris can collect and form a large blockage. Aside from the fact that they may not actually completely dissolve clogs in your drains, chemical drain cleaning solutions have other side effects, as well. First off, they’re extremely toxic—even just breathing in the fumes can harm you, your family, and even your pets. They can cause injury to the skin and eyes, too. Plus, due to the caustic chemicals, liquid drain cleaners from the store can damage the lining of your drain pipes. This means that you may have to prematurely replace your plumbing, something that would of course be nice to avoid for now if you can, right? There are natural ways to relieve simple clogs, if it’s not enough to call in a professional plumber quite yet. For instance, you can use a bit of baking soda and vinegar, washed down the drain with boiling water, to see if that helps. Do be careful when using boiling water! If that doesn’t work, it may be time to call in a pro. The good news here is that we have the proper tools and the training to use them. You may need hydro-jetting, for example. This is when we use an extremely high-pressured hose to scour the inside of your pipes. Not only does this clean your drains, but it prevents clogs from forming in the future, too. This is truly the best way to achieve effective and efficient drain cleaning for your plumbing system. For professional drain cleaning in Tampa, FL, from trained experts, look no further than IERNA’s Heating & Cooling. Contact us today!